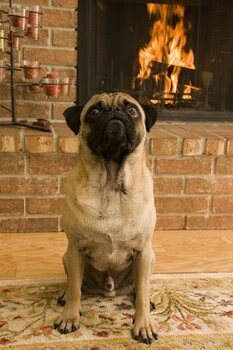 For 2011, July 15th has been designated as National Pet Fire Safety Day. This holiday is designed to help safeguard pets against the devastating physical effects of house fires while simultaneously protecting the owners against serious financial and emotional loss. Maintaining dog and cat insurance can help to defray the veterinary costs of injuries sustained in a fire, but prevention is the best way to ensure the pet health and well-being. The helpful advice provided by pet welfare organizations can help reduce both the threat of fire and the potential risks to dogs and cats in the event a fire does occur. Pets are often fascinated by fire. As a result, pet owners should never leave open flames or hot objects like stoves or candles unattended when pets are present. This is especially true in the case of puppies and kittens who typically behave in a more impulsive fashion. Covering or removing loose electrical and electronic wires is also essential in order to protect the pet health. Many fires start with frayed, chewed wires that can cause electrical shock and injury to pets as well. In the event a fire does break out, ADT offers a free Pet Alert window cling that informs firefighters of the location of pets within the home. Information on this offer is available at https://www.adt.com/resi/programs/pets/. One of the best ways to protect pets is to purchase dog or cat insurance from a reputable provider. This insurance covers necessary veterinary services to ensure the cat or dog’s health needs are adequately provided for. Additionally, dog and cat insurance companies often offer valuable tips on pet safety and strategies for raising happy, healthy cats and dogs in a safe environment. Finding the right pet health insurance for cats and dogs benefits both pets and owners alike by ensuring that the animals receive the veterinary services they need and that owners can more easily plan for the costs of those services when they become necessary. Sometimes, pets are the ones doing the protecting thanks to their keen senses. Liz O’Connell of Red Hook, New York discovered this one night when her three-year-old German Shepherd persistently prodded her and insisted on going outside, even though Liz was in bed. “As I walked barefoot across my kitchen floor, it was hot underfoot,” said Liz. “I peeked down the basement stairs and saw the glow of a fire on the walls. I grabbed my dog and immediately left the house and went to neighbors to call the fire company.” Liz lost her home, but credits her dog with saving her life.